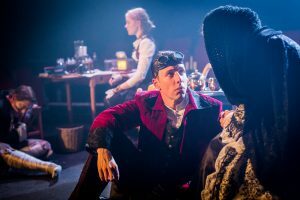 Just when you thought you knew everything there was to know about Mary Shelley’s immortal Frankenstein there comes a bold and thrilling stage adaptation that breathes life into the Gothic horror story. Writer and director Ross McGregor has created a monster that appears to simultaneously evoke profound sympathy and poignancy along with horror and a chilling revulsion. 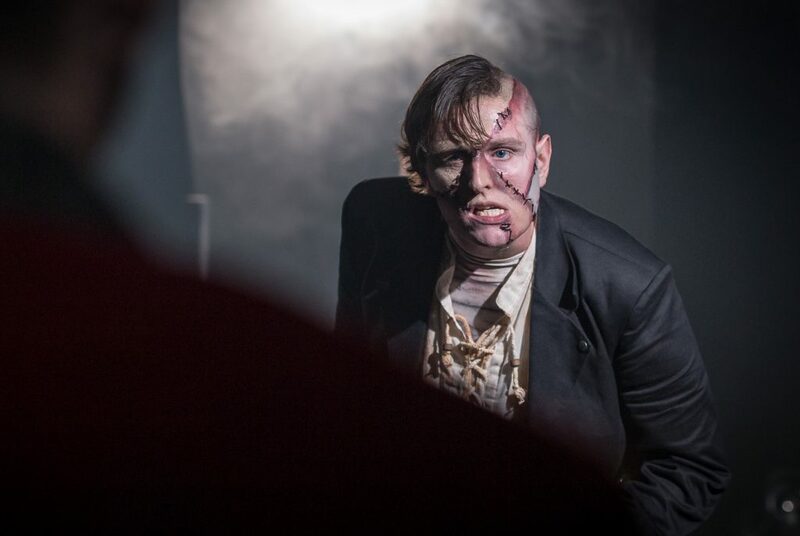 McGregor’s innovative version of Frankenstein, for his Arrow & Traps Theatre Company, which opened at South London’s Jack Studio Theatre on Thursday night, thankfully avoids all the cliches and Hammer Horror schlock. Instead the artistic director has woven strands from the original narrative, refined and reanimated them. It sparks the story into being with a lightning bolt that energises the major plot points from the book but with a refreshing new perspective. Here we have a dying Mary Shelley, gripped by fevered hallucinations and remembrances, distorting time to re-live scenes from both her past and present but also from her most famous book. The ghosts of the past swirl around until she isn’t sure of anything. As a director McGregor has thrown caution to the wind and come up with a hugely ambitious production that boasts tremendous verve and imagination. Scenes are played out simultaneously or dancing around each other with most of the cast, particularly Oliver Brassell, performing lightning character changes. In one breath he is Percy Shelley or even his son, also called Percy, or he is Victor Frankenstein’s best friend, Henry, while in others he plays a struggling farmer called Felix whose blind sister befriends the hideous monster. 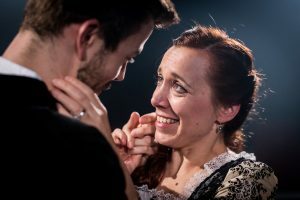 But at its heart is a trio who carry the weight of the play – Will Pinchin as the horribly stitched together monster; Christopher Tester as the ambitious and grieving Victor Frankenstein who is obsessed with finding the key to life itself; and Cornelia Baumann as the writer and narrator Mary Shelley. Mary’s life was steeped in death. Her own mother died giving birth to her and, later, she endured endless miscarriages or lost children in their infancy. It’s no wonder that she, like her creation, yearned to save those she loved and extend the lives of humanity. But, while enthralling a literati gathering with her horror story, she was also reflecting a remarkable age when society was on the cusp of major change. The Industrial Revolution had brought about the invention of astonishing machinery. Electricity, medicine and science brought about colossal advances. Suddenly people questioned religion and god. What if the power to guide our lives were in our hands and not an unseen deity? She envisaged Frankenstein as a single-minded trail-blazer, intent on pushing the boundaries of medical science, his first experiment at creating life in a laboratory truly revolutionary. And what he created, discarded and eventually rejected, terrified of its potential power, was the epitome of evil, an inhumane and soulless creature cobbled together from the remnants of slaughterhouses and mortuaries. But Pinchin’s very physical and emotionally intense performance, aided by his own inventive make-up, instead gives the creature tremendous pathos. He is capable of great harm, instinctive yet also compassionate, an anti-hero of his time who rails against the mistreatment of the unfortunate and vulnerable. Un-named, not worthy of even that most basic of dignities that would define him as a human being, he stumbles into the story barely out of the clinical womb which sired him. Hardly able to walk, his only rudimentary abilities are to discern everything by taste and smell. More animal than man, he lopes about, unable to speak, surviving in only the most primitive way – until he meets a young blind girl who, unable to judge him on appearance alone, takes him under her wing and teaches him to talk and read. Very soon she’s got him onto Macbeth and Milton’s Paradise Lost – hugely ambitious I’d have thought but their themes moot to the plot – and soon he is more of a gentleman than the lunatic who created him. But the relationship between master and slave is doomed to tragedy as is that of their creator and her family members. Baumann delivers a powerful performance that veers from a skittish and studious young Mary who seduces her sister’s married boyfriend, the poet Percy Shelley, to a woman crippled by depression, anxiety and illness. 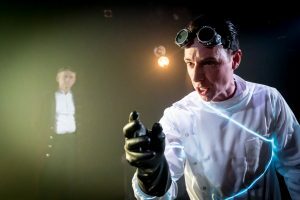 Tester too takes his character from wide-eyed and naive young medical student, inventing light-bulbs and steam-powered toasters, to a man haunted by his mother’s death and determined to be at the vanguard of a brave new world. But it is Pinchin’s sorrowful monster who leaves a lasting impression. His interaction with the young, blind Agatha (a fine turn by Zoe Dales) is poignant, heartwarming and funny. The only thing that doesn’t ring true is her language. It’s far too 21st century. There are a couple of stunning, stand-out, set pieces in the production, brought to the stage by a superb backstage team of creatives. My only criticism, if indeed it’s possible to find any in this compelling drama, is that it is overlong and could do with at least 20 minutes cut out. You sometimes feel that McGregor wants to include everything, which indeed, he has tried to do by having the Shelley life story, including her family’s involvement, play alongside the Frankenstein yarn. It’s all great stuff but, at 2hrs 25mins, is too lengthy. It needs its writer to take a step back and let his director’s instinct take charge. 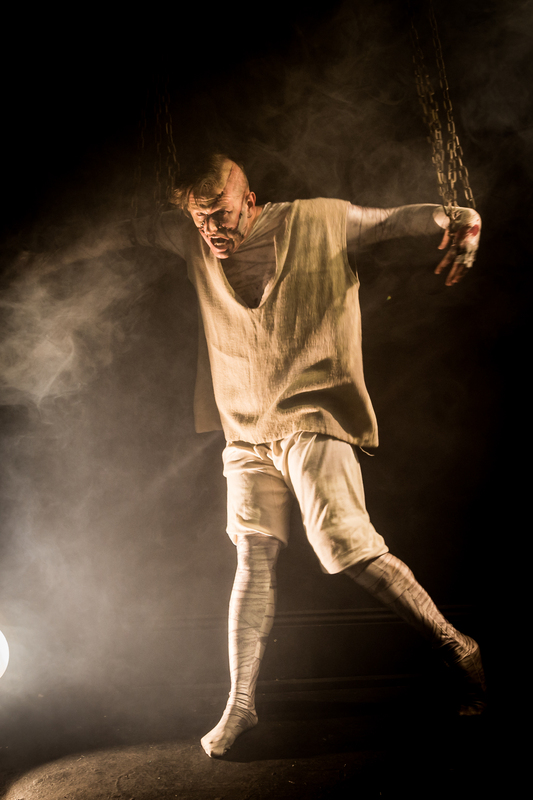 Frankenstein plays at the Brockley Jack Theatre until October 21. It plays at Guildford’s Yvonne Arnaud Studio from November 2-4. Ambitious, bold, direction and design, inovative story-telling and compelling performances breaths life into Mary Shelley’s Gothic Horror story, Frankenstein.